The new DTW180 18V LXT Impact Wrench will drive home M8 – M16 standard bolts and M6 – M12 high tensile bolts. It will deliver 180Nm of tightening torque and 310Nm of nut busting torque while the 2-stage impact power selection delivers up to 3,600ipm in hard mode, 2,000ipm in soft, with a no load speed of 2,400rpm in hard mode and 1,300rpm in soft mode. 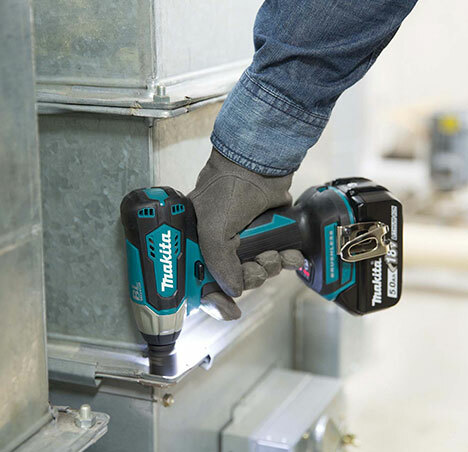 The DTW180 is also the first 18V impact wrench in the Makita range to have a 3/8” square driving shank. Producing an excellent 30 watts of suction power in Hi mode and 11 watts in Lo mode, with a maximum airflow of 1.4m³/min, the DCL181F has a maximum sealed suction of 4.2kPa. The rubberised ergonomic soft grip handle features a touch button switch where high/low suction power settings can be easily selected. This low noise vac has a run time of 40 minutes when used in Lo mode with a 3.0Ah Lithium-Ion battery, and 20 minutes in Hi mode. The efficient collection filter will allow a dust capacity of 0.65 litres and also featured on this vacuum is a convenient LED job light for those dark corners. The DCL181F comes in brilliant white instead of the traditional Makita blue, and is available as body only to utilise existing Makita 18V batteries. Weighing a comfortable and lightweight 1.4kg this new Makita vacuum comes with floor and sash nozzles for a variety of applications.